We return with a fun game set in the latest installment to date of GTA, Grand Theft Auto. The main characters of GTA V, come in this fantastic game of looking for differences. They are Trevor, Michael and Franklin, which you can handle in the story mode of the hit Rockstar game. We still do not have a date for GTA VI, but while we wait we bring you this game. They are going to show us a couple of images, one above and one below, that apparently are the same but, it is not like that since they hide five differences that you must find. The lower image is the original and you will have to look at the one above to see the changes that there are from one to another. When you find the difference, you will have to click with the left mouse button of your PC in the correct place of the fake image. Find the five differences to overcome the level and be able to automatically move to the next, where a new image awaits you with five new differences. The best thing about this game is that you do not have a time limit, so you can take it easy. Another thing that makes the game easier is that there is no penalty for failure, so you can try to find the most difficult differences by chance. Do not wait any longer to play Grand Theft Auto V in your game of looking for differences. 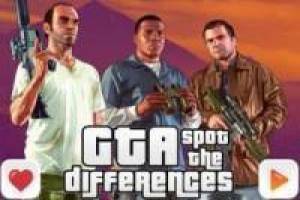 Enjoy the game Grand Theft Auto V: Find differences, it's free, it's one of our gta: san andreas games we've selected.